There’s some mixed news coming out of Vancouver, Canada this week. On the one hand, the city announced at an international sustainability summit that it would commit to using 100 percent renewable energy to power its electricity, transportation, heating and air conditioning within 20 years. On the other hand, Vancouver is also dealing with a fuel spill in the waters of English Bay that is washing up on beaches and threatening wildlife. 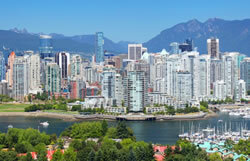 On March 26, Vancouver’s city council voted unanimously to approve Mayor Gregor Robertson motion calling for a long-term commitment to deriving all of the city’s energy from renewable sources. At the ICLEI World Congress 2015 this week in Seoul, South Korea, the city went a step further, committing to reaching that goal of 100 percent renewable electricity, transportation, heating and air conditioning by 2030 or 2035. Right now, Vancouver gets 32 percent of its energy — that includes electricity, transportation, heating, and cooling — from renewable sources, so the goal is ambitious, but not impossible. According to the Guardian, Vancouver could get all of its electricity from renewables within a few years, but transportation, heating, and cooling may prove more difficult.